Tatsuya is well-known for being the premier sushi destination of Singapore, but it is also well-known for its high prices. However, Tatsuya offers good value for money lunch bento sets and this is what I came for to try. They’re almost filled up everyday and reservations must be made if you want to secure a seat there. Luckily the bentos are offered everyday expect for public holidays, so I chose to go on a weekend. 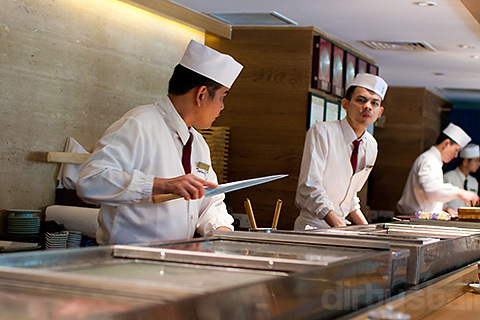 They have a whole row of sushi chefs manning the long counter, each one serving the customers nearest to them. 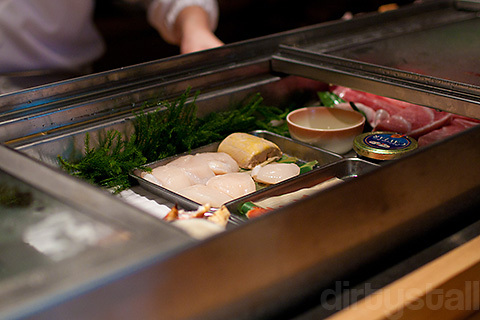 In front of them is a long line of steel refrigeration compartments filled with fresh seafood, waiting to be turned into tasty morsels for hungry people. 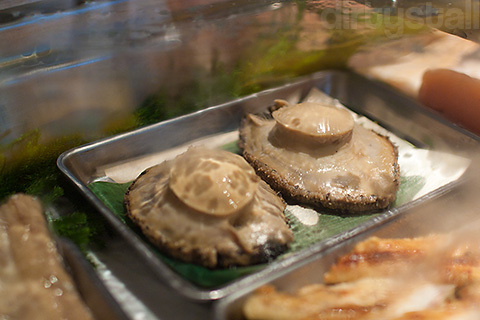 The one in front of my seat stocked 2 huge abalones! 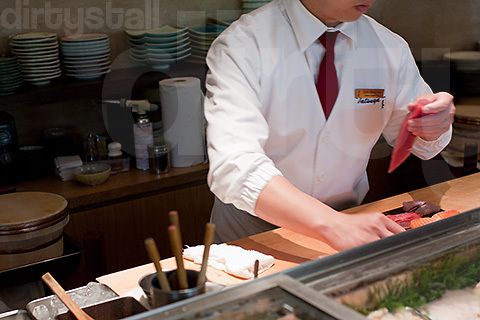 And here is a sushi chef, deftly making some sushi with quick and sure hand movements. I had the standard lunch bento set, which comes with 6 pieces of sushi, 3 tuna and 3 cucumber maki, assorted tempura, tamago and 2 California maki. Rounding this off is chawanmushi, miso soup and fruits for dessert. It’s definitely very filling by the time you finish everything there. 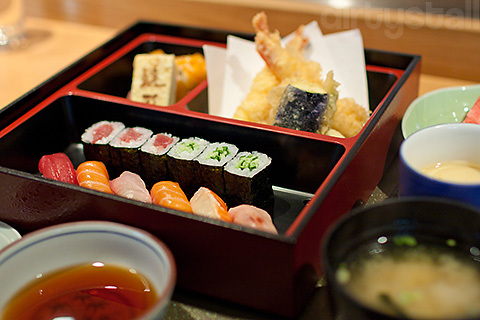 The tempura was light and crunchy, the tamago was sweet and fluffy, and the chawanmushi was so smooth and delicious. The sushi have really fresh toppings; salmon, tuna, hamachi and prawn. However they were a lot smaller than I expected, about half the size of the normal sushi outside. Still, it doesn’t take away from how good they were. This is the ladies lunch set, which is similar to the bento except only 4 pieces of sushi, and their tempura are 2 pieces of ebi kakiage. But the biggest difference there is the soba instead of the maki. Tatsuya’s lunch sets are definitely one to try for, given their value for money. There are more lunch sets as well, such as a sashimi or unagi set, but these 2 are the more popular ones. 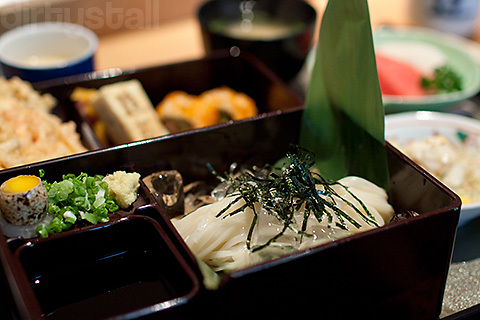 11 Responses to "Lunch at Tatsuya"
I love these photos!! =) And yes, Tatsuya’s set lunches are really affordable! Thanks! They are really good value for the money! The sushi you eat at other places, aka SSB lolx, are way to big then lol. Sushi at Aoki, Nogawa and the likes are similar in size to Tatsuya’s. Hahaha yah the SSB ones are pretty big actually! Btw that is inaniwa udon not soba hahaha. Tatsuya’s chawanmushi is the smoothest & best I’ve ever tried. 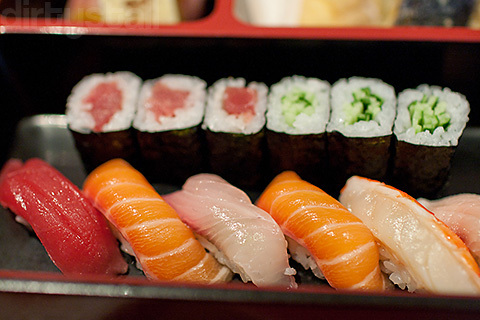 the sushi all look delectable! don’t mind me asking – how much is a bento set on average? 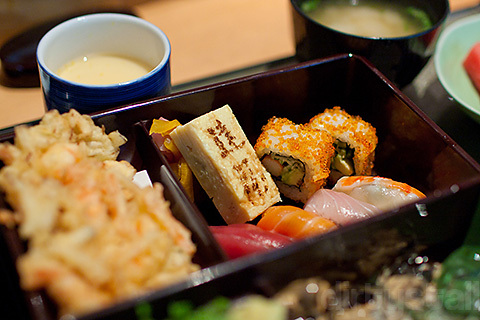 On average a bento set there costs about $28++. Btw great blog you have! nice photos! 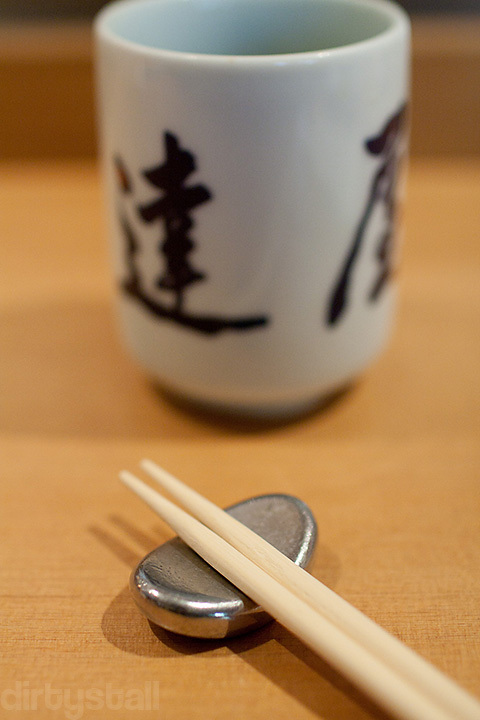 do you prefer tatsuya’s or chikuwa tei’s chawanmushi? On the taste and quality of the actual chawanmushi, Tatsuya is better but for value, Chikuwa Tei just has so much more!! Tatsuya’s chawanmushi is totally plain with just some yuzu zest on top.